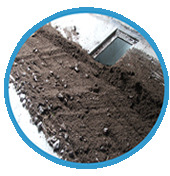 Any grit, sand, soil, glass or metal that enters the digester is removed automatically. 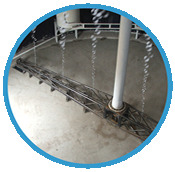 This enables the digester to consistently run at maximum capacity, without the need for a periodic shut down to remove grit. 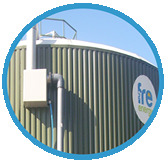 This enables the Fre-energy digester to process shock loads of high strength feedstocks containing fats and sugars that are prone to causing acid indigestion. Removing the foam allows the bacteria to recover quickly to optimum gas production. Our AD's operate using a very low parastic load. The energy used to mix a digester with the methane gas is a fraction of that used in a mechanically mixed system. 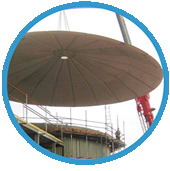 Our thermally insulated fibreglass roof has unrivaled strength and has been proven to last over 25 years. It helps retain heat in the digester and will not blow away or puncture in stormy weather. 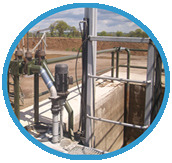 Our simple loading system is both flexible and reliable; the sump provides a central drain for the site and a stone trap prevents any large objects damaging the loading pumps. All the equipment required to run the process is contained in a single unit. It is delivered to site, tested and running, so only needs plumbing and wiring to the digester. 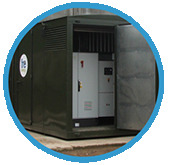 At Fre-energy we build our own 80kW CHP's which are self contained on a skid unit. 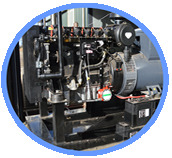 Up to three engines can be installed in a 20ft acoustic shipping container, and any CHP can be replaced with a service exchange unit in a matter of hours. 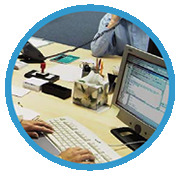 Our technical team can monitor all information from the control unit and CHP online. They can ensure that the system is achieving optimum performance and alert the client or a Fre-energy engineer of any potential problems. 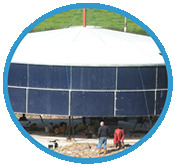 We use standard agricultural tanks either made from glass enamel steel plates or precast concrete panels, these are quick and easy to erect and are significantly cheaper than poured in-situ or stainless steel.